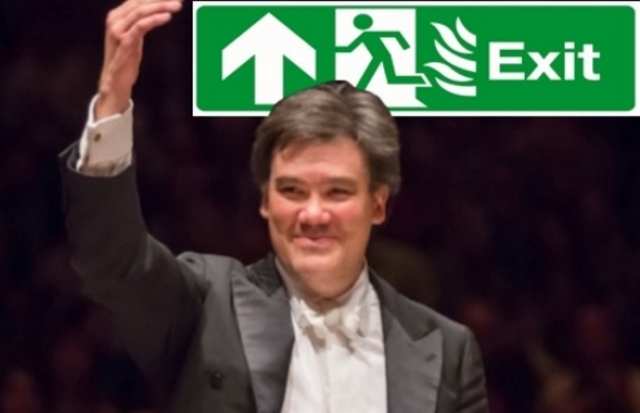 Alan Gilbert Exits the New York Philharmonc Photo by Chris Lee. Photoshop by the author. When it comes to the exit of Alan Gilbert from the post of Music Director after only eight years, the New York Philharmonic has put on its bravest face. This week’s season-ending series of concerts, (promoted as “A Concert for Unity”) have featured starry opening acts for America’s oldest orchestra. Yo-Yo Ma and members of the Silk Road Ensemble played Thursday night. On Friday, jazzmaster Wynton Marsalis took the stage, backed by a piano trio. (Saturday's concert, broadcast live on Facebook, featured the orchestra al fresco.) These concerts also mark the launch of a new orchestral initiative by Gilbert. A collaboration with the United Nations, this is the latest effort at bringing international musicians together in a search for better communication and diplomatic understanding. On Friday, Marsalis and friends where introduced by Gilbert, who beamed with approval as the legendary trumpet player took the stage. They offered a pair of tracks: a slow, mellow spiritual and a tune introduced as “Russian Blues.” The first cried in anguish, with Marsalis fanning the bell of his trumpet with a derby mute. His soulful tone burst at last into shrieks of spiritual anguish. The blues was more playful with solo showpieces for all four musicians including a lengthy bass solo that held the audience rapt. Marsalis played a second chorus with his wah-wah mute, letting the listener hear the tune reprised with a very different trumpet voice. The remainder of the night was devoted to Mahler's Symphony No. 7, the most sprawling and challenging of this composer's mature works. Built in five movements with the central three serving as a long intermezzo, this symphony contains the darkest and weirdest music Mahler ever wrote. It is a long journey from Stygian murk to harsh and unforgiving daylight. This is the last of his three “middle period” symphonies, a work that holds considerable terrors for any unwary (or unworthy) conductor who dares to tackle its five movements. The first movement is constructed from three distinct melodic groups, requiring a firm hand to make the orchestra move in lockstep through this unforgiving musical terrain. However, Gilbert’s decision to blend the Philharmonic forces with the young musicians of his philanthropic initiative undercut the effort. Wild energy is no substitute for disciplined music-making, and the peccadilloes of this performance were audible from the first entry of the strings. That said, there were flashes of brilliance and even occasional transcendence in this first movement. The ascending three note-scale yielded to a wash of harps. A sweet, longing string melody followed, and the orchestra scampered pell-mell to the end of the first movement. The first of two slow movements (both marked Nachtmusik) was very fine indeed, with the Philharmonic players leading their younger brethren in a mysterious nocturnal mission through the Alps, complete with bird-cries and clanking cowbells. The swirling, mysterious third movement came off with the right mix of irony and circus horror. This is uncertain music that capers on the edge of atonality without ever quite falling into the Schoenbergian abyss. (The Seventh was that composer’s favorite among Mahler's works, and his endorsement of it may have rescued the work from obscurity.) The second Nachtmusik (marked Andante amoroso) followed, with soft horn calls and the dip of oars in a glassy lake answered by mandolin and guitar. Then the dawn burst in a barrage of timpani, trombones and horns, a theme that Mahler pillaged from a leitmotif in Wagner’s Meistersinger. This is music that epitomizes forced, grinning joviality. Under Gilbert, the grin became a rictus, with the brass fanfare alternating with a chivvying, thrusting figure in the low strings that bustled and bubbled along. This massive movement felt longer than usual, with the abrupt tempo shifts and reprises of thematic elements from the first four movements feeling labored and unfocused, coming to an end in a final blaze of major-key light. (Published with the permission of Superconductor).